Every once in a while, a talented artist rises slowly through the ranks of local musicians and reaches the status of being poised to become a national success. 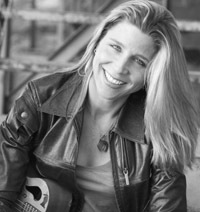 Terri Hendrix, originally from San Antonio, Texas, is one such artist. The first time I heard of her was in the early 90’s when she was performing at open mics in the San Marcos area. I believe it was at the now defunct Haight Ashbury club on the west side of town. I didn’t pay close attention to her at the time; now, I can’t help but take notice of Terri’s music. 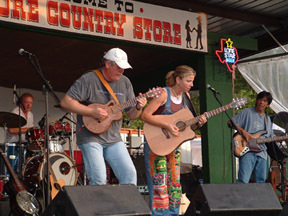 She is well-known in central and south Texas, as well as, at folk music festivals across the nation. Her grassroots fan base has grown from a small core group of fans to a quite formidable following. Last year, I saw her perform at the Austin City Limits Music Festival with a full band. I was thoroughly impressed with her now refined talent. Her first break came back in late ’96 or early ’97. She was recording some vocals at the Firehouse Recording studio in San Marcos. The engineer was quite impressed with her raw talent, and sent a tape to Lloyd Maines. Lloyd, who played with Joe Ely (and other popular Texas musicians), now was focusing on finding and producing new talent. Terri obviously caught his attention. He decided to meet with her and eventually became her producer and band mate. He and Terri soon added Glenn Fukunaga (on bass), and Paul Pearcy (percussion). Seven years and seven CD’s later, these four very talented musicians are still playing together. Needless to say, they put on an awesome live show! Terri’s latest effort, “The Art Of Removing Wallpaper” is as solid as anything she has released in the past. The first song on the CD, “Breakdown” is an introspective look at how we try to hide our true feelings from each other. Yet, we cannot hide them from ourselves. “Enjoy The Ride” has an energetic harmonica intro which leads to more of a blues or jazz feel. In this song, there is a certain amount of naïve sincerity which I can certainly relate to. “Judgment Day” attempts to tackle the political issue of those who use God and His name to justify war and the killing of innocent people. “Monopoly” is -- in my opinion -- the most powerful song on the CD. It is a not-so-subtle swipe at Clear Channel Communications. In Terri’s words, “I miss the spice, in the melting pot of our lives, it goes down easy, but it sure ain’t got no soul.” This song shows how national media consultants have turned a once local music scene into a watered-down nationwide commodity -- what a crying shame! I echo your sentiments on this song, Terri! “One Way” is the song which is getting the most airplay locally. I saw her perform this with her band in Helotes, Texas at the Floore’s Country Store (just northwest of San Antonio). She, Lloyd, Glenn, and Paul formed a line at the front of the stage. Paul played a djembe drum, adding to the rich, smooth texture of this beautiful song. From serious, to somber, to humorous -- Terri is not afraid to let her hair down and express her opinion. She adds an element of humor in her live sets which is family oriented, yet appreciated by most intelligent adults. I’ll leave the rest of her new CD for you to discover. Terri appeals to a broad audience. She is not stuck in a niche of today’s commercially produced music, nor is she afraid to delve into any variety of musical styles. She has become an engaging entertainer as well as a successful singer/songwriter. Her show at Floore’s Country Store in Helotes on Sunday, August 8th was to benefit children in the San Antonio area with special medical needs, as well as, nervous and mental disorders. She calls them “Handi-capable." Terri is someone who not only has a message in her music, but actually does something to help the local community. With Terri, I get the feeling that “Monopoly" should be more of a children’s board game, not a corporate controlling power ploy! I believe that Terri is reminding us of the things in life that really matter -- in one very wonderful way!